This is a guest blogger recipe post from the great folks over at Voga wines. If you are looking for some fabulous great tasting wines I highly suggest you check out the wines that Voga has to offer. 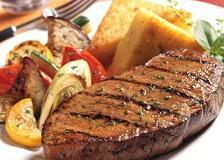 With basic beef dishes, wine choices are plentiful. Look for a wine like VOGA Merlot, big enough to compete with the beef’s full taste and flavorful enough to balance the fats and spices in this grilled pepper steak. Heat coals or gas grill for direct heat. Mix all spices ingredient. Lightly brush half of the oil on both sides of beef. Press spice mixture onto both sides of beef. Let stand 15 minutes. Lightly brush remaining oil on onion slices. Cover and grill beef and onions 4 to 5 inches from medium-high heat 10 to 12 minutes, turning once, until beef is medium done. Brush honey on onions. Note: I would like to thank the PR company that is working with Voga for sending me the recipes to share with me readers! We appreciate it!